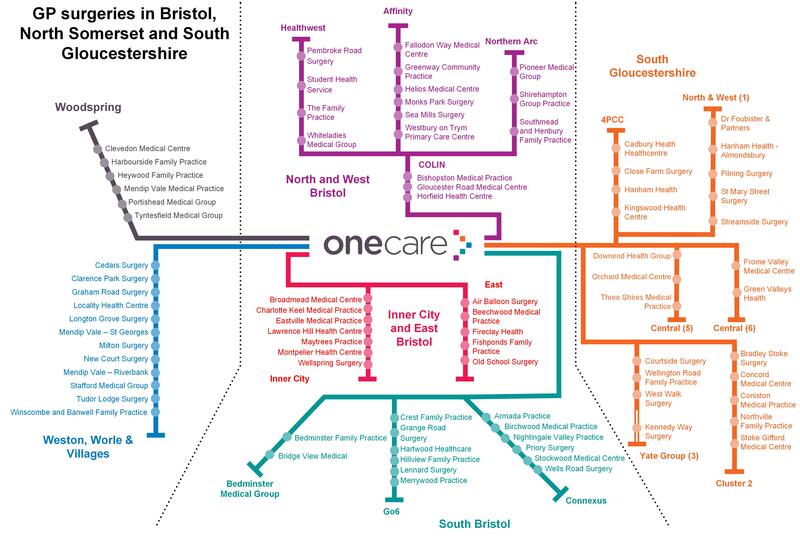 We have just over 80 member practices who serve approximately 1 million patients across Bristol, North Somerset and South Gloucestershire. A few years ago, we needed to find an easy way to show where all of our practices were located. This tube map is what we came up with and it’s been extremely useful for us and very popular with other organisations across the area who work with practices. These practices are independent businesses, each serving the needs of their patients. They also work together in a number of different ways. Firstly, across the whole area, as part of One Care. Secondly, they have formed localities, of which there are six across the area – two in North Somerset, three in Bristol and one in South Gloucestershire. These cover a patient population of 100,000-200,000. Finally, some practices choose to work together in clusters. These are smaller groupings. You can see all of these on the tube map above.